There is a reason why sportbikes are long, keep a lot of weight over the front, and have front ends that don’t turn a ton and have beefy steering stabilizers: it’s so you don’t kill yourself. But, if you’re going to kill yourself, doing it on a Ducati Panigale-powered Grom is a great way to do it. Take a second and peruse this album from Mario Kleff, the bike’s builder. The bike’s build and purpose are a little hard to decipher given that Mario lives in Thailand and his English isn’t the best (though it’s better than my Thai), but I don’t think it takes too much detective work to figure out that this just seems like a great bad idea. 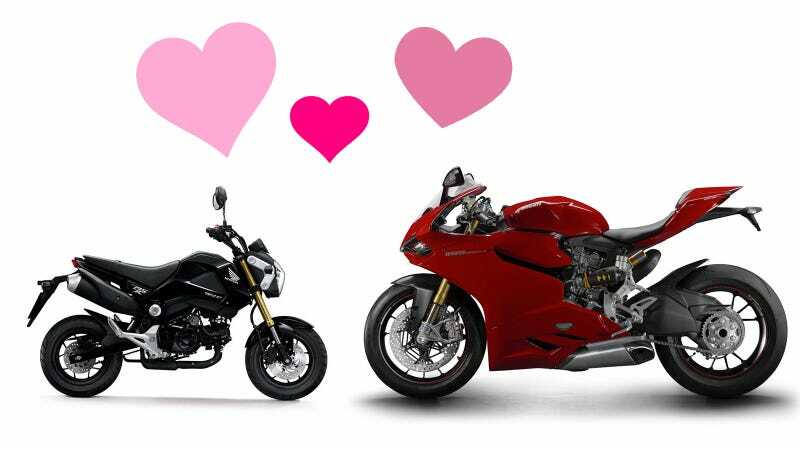 The good news is our dreams are still alive as Mario has gotten himself a second Grom and a new Ducati Panigale 1199R for his second attempt. Why? The Mod Dam concept is worth to keep going. Professionalism is to complete a mission you are believing in, envy and jealousy is to do nothing but to laugh about and to talk badly. At the end I will have it, and all others who keep talking negative will be sucking on thumb. This time the development seems to be a bit costly… we had the issue with the fuel line leak. Needed to buy another Panigale 1199R obviously. Let me tell you: if you buy your future wife a diamond ring for the ceremony but lost it on the way, what are you going to do, give her a glass ring instead?! When you love that woman, you will work out a second round for the diamond ring - simple is that. Also, if you have more time, scroll through Mario’s Facebook page. There are some weird choppers in there, and a dyno claiming he has a Hayabusa that makes 900 horsepower at the rear wheel. You better believe I’ll be doing my damnedest to get the Mod Dam for next year’s 24 hour endurance race from hell. Those other teams won’t know what hit them.